The Wey Valley Solar Schools Co-operative is a community owned energy co-operative set up by local people from the towns of Guildford and Godalming in Surrey. 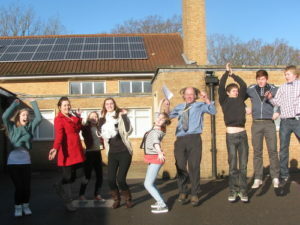 In 2011 we started with 238 kW of solar panels on the roofs of six state secondary schools in Surrey. Since then we have completed further solar installations on a further four schools as well as increasing the generation capacity on some of our founder schools. We now have a generation capacity of just under 590kW over ten school sites. We have already paid our six founder solar schools £8,700 which has been shared out equally between them. We are still keen to install solar array on any school in the Waverley and Guildford districts. If you are a teacher, governor, parent or pupil at a school interested in joining the Co-operative please contact us. In 2013 we installed low energy lighting at a primary school in Harmondsworth using a pioneering (for a community enterprise) lighting services contract with the school. We have just (autumn 2016) undertaken further work on an LED energy saving project in a local Godalming school to see if we can develop a financially viable and self-sustaining business model for further LED projects. We also offer advice and support to support other communities to replicate what we have done and they are welcome to contact us.